We have created this page to assist you with the Kindergarten Registration and Kindergarten Screening process. It is an exciting time for you and your child and we hope to make this transition an easy and fun process. We are excited to meet you and your child! Raymond Elementary (RES) is a Kindergarten through Grade 4 school and is located at 434 Webbs Mills Road in Raymond. Windham Primary School (WPS) is Kindergarten through Grade 3 school and is located at 404 Gray Road in Windham. Both schools have their own websites for you to explore and get a peek at what happens at their school. Your first step is to register your child for Kindergarten. We have an online process for this step. Please note per state law, your child must have turned 5 years old on or before October 15th, 2019. This will take you step by step to register your child. You will need to start by creating an account. Keep in mind there are multiple forms to fill out as your child is new to our schools. How long will this take ? Usually 15-20 minutes. If needed you can save and return to complete later. There is also other information for you to read. These include a Home Language Information, our Immunization Policy, and our Transportation Information. Once you have filled out all of your registration information, the next step will be to make an appointment for the screening. 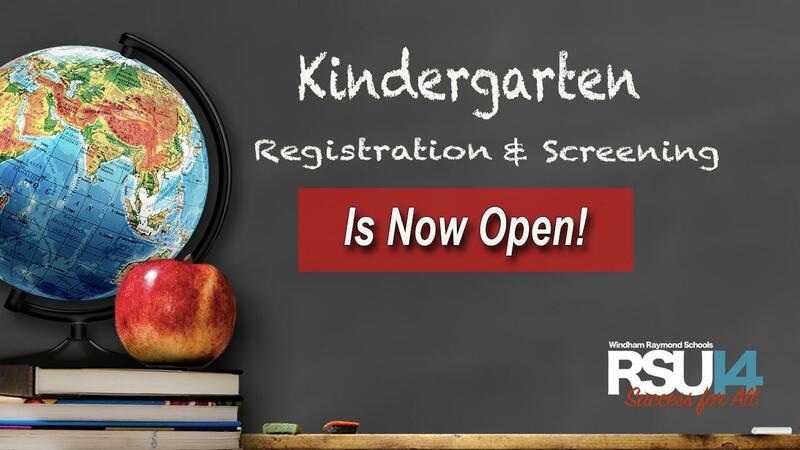 After you have completed all of the information in the 6 areas of the registration, the page will display a button on the Home Page: Click To Schedule Kindergarten Screening. Follow this step if your child is attending Windham Primary School. This will open a new page with steps to follow to choose a time if your student is attending the Windham Primary School in the fall. Raymond Elementary families - do not sign up for a time online - please call Miss Mindy at 655-8672 to set up a a screening time. Kindergarten Screening will be held at one of our schools. During the screening process, parents will meet with some of our Kindergarten staff and the children will work with an adult and go through a series of centers. These centers are designed for us to get a snapshot of your child. They will count, find letters, toss beanbags, and even hop up and down! Our staff are well trained and are exited for this day to meet our new incoming students. Below is a video of Kindergarten Screening. Ms. Cummings second grade class from Raymond Elementary wrote the script and created this video just for incoming Kindergarten students and parents. Take a look at video and share with your child so they can get a sneak peek of what the day will look like when they arrive to screening.